The other night I watched the 1931 classic, Dracula, starring Bela Lugosi. It has been many years since I have watched it and thought now would be a good time to take it in. I am happy to report it is every bit deserving of the label of "Classic". 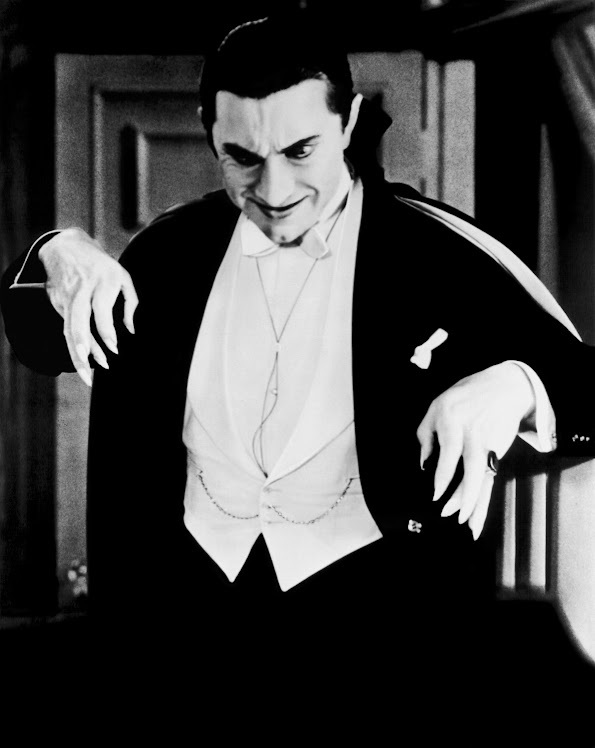 Of course, much of the credit goes to Mr. Lugosi, who was truly chilling as the famous Count. I'm sure audiences that watched his performance in 1931 must have been terrified with his portrayal. Dwight Frye, who played Renfield was convincing transforming the character from the confident business man in the beginning, to the deranged lunatic he becomes. There is a small amount of comic relief in the form of Martin (Charles Gerrard), one of the workers in the sanitarium where he is asked on a few occasions to rein in Renfield. I remember liking those little moments as a kid, but now watching it in 2011, I felt it was unnecessary. A few things I had forgotten. You never actually see Dracula bite anyone, and you also don't see the stake driven through his heart, you hear him die offscreen. Yet even without these things, Lugosi's performance provides plenty of creepiness as evidenced by the video clip at the bottom of this post, or the photo at the bottom of this page. If you haven't seen it yet, or if like myself, it's just been a while, I highly recommend picking it up, or streaming it on Netflix. I give it a Netflix rating of 4 stars out of 5.